A few months ago we reviewed an 8GB "Elite" DDR3 memory kit from Crucial.com's Ballistix series of high performance products. When they approached us about handling a review of a new memory kit from the Ballistix family, we gladly accepted. This particular kit is known as the 16GB 1600MHz Ballistix Tactical LP (low profile) kit which is marketed to gamers, PC enthusiasts, and power users. 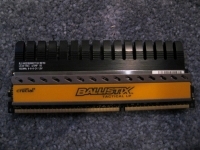 The Crucial Ballistix Tactical LP kit being reviewed today contains 2x8GB memory sticks with 8-8-8-24-1 timings. Voltage requirements are lower than standard kits, coming in at 1.35v. With a lower voltage rating you should theoretically be able to achieve a better overclock. The specifications listed below were taken straight from the product page on the Crucial.com website. The most notable features of this memory kit are the very low profile (roughly 40% smaller PCB than the typical stick of RAM), CL8 timings, and the low voltage requirement of 1.35v. As you can see from the image below, the low profile memory of the Tactical LP series is half the height of the previously reviewed Elite series memory kit from Crucial. This is paritcularly useful if your CPU heatsink or fan overhangs your memory slots, making tall modules unusable.